We’re past due for a look at another Powerhouse Plant, these are Plants For All Seasons - individual varieties which provide color and interest for at least two seasons of the year and not just a fleeting flush of flowers followed by months of not-very-much. I feature over five hundred of them in my latest book, Powerhouse Plants, and every month in Gardeners' World, Britain’s top-selling garden magazine (and also available in the US) I focus on one very special Plant For All Seasons, highlighting three features which bring color to the garden at different times of the year. This month, in the magazine, I feature Cornus ‘Midwinter Fire, next month it’s Mahonia ‘Charity’. And every month or so, here on my Transatlantic Gardener blog, I bring you details of another Powerhouse Plant this month it’s Tiarella ‘Mystic Mist’ (above, click to enlarge). Today, here in Pennsylvania, we’re snowbound but yesterday the rich red tints of Tiarella ‘Mystic Mist’ caught the eye in a shady corner by the front door, under the spiny, bluish green leaves of the hybrid holly, Ilex x meservae. This is its winter livery, but this plant seems to be in an almost imperceptible but constant state of change. For in summer, its bright leaves are densely dusted in silver speckles, with a rather variable red flash in its central veins. In winter the red and purplish tones are more dominant. In spring, short spikes of fluffy white flowers, opening from pink buds, add a third dimension (left, click to enlarge). There have been speckled forms before, but ‘Mystic Mist’ is more vigorous and more robust in the garden. It spreads well, although it’s better in soil with good drainage. It throives with us tucked bteween the holly and a rhododenendron. There’s just one problem. In Britain ‘Mystic Mist’ is available from Heucheraholics and from Plantagogo. But, in North America, its creator has withdrawn it. You may still find it in retail nurseries, but I couldn’t find anyone selling it online. That’s a shame. Let’s hope it’s back soon. And you why not take a look at some more fine Powerhouse Plants, Plants For All Seasons, here on my Transatlantic Gardener blog. Time for a look at another Powerhouse Plant, these are Plants For All Seasons - individual varieties which provide color and interest for at least two seasons of the year and not just a fleeting flush of flowers followed by months of dull foliage. I feature over five hundred of them in my latest book, Powerhouse Plants, and every month in Gardeners' World, Britain’s top-selling garden magazine (and also available in the US) I focus on one very special Plant For All Seasons, highlighting three features which bring color to the garden at different times of the year. This month, in the magazine, I feature Cornus kousa, next month it’s Ampelopsis brevipedunculata var. maximowiczii ‘Elegans’, a lovely plant in spite of its long-winded name. And every month here on my Transatlantic Gardener blog I bring you details of another Powerhouse Plant this month it’s another with a long name: Polygonatum odoratum var. pluriflorum ‘Variegatum’ (click to enlarge) – a perennial with four, yes four, different features. As I look out of my window today, it’s the bright yellow, daintily dappled autumn leaf color which stands out, arching elegantly. Earlier, it was the neatly white-edged green foliage that caught the eye, with the addition of small, green-tipped white bells dancing daintily. Those white bells are followed by blue-black berries although, I have to say, they don’t seem to last very long here before something eats them. But before all that, right at the start of the season, there are these dramatic red spring shoots. This is a vigorous, graceful multi-season perennial for light shade or a site that’s shaded for part of the day – I’d say its spring to autumn interest and that fact that it’s so easy to grow makes it indispensible. In North America you can buy plants of Polygonatum odoratum var. pluriflorum ‘Variegatum’ from Digging Dog Nursery, and a whole range of other exciting polygonatums is available from Plant Delights. In Britain you can order Polygonatum odoratum var. pluriflorum ‘Variegatum’ from these RHS PlantFinder nurseries. Powerhouse Plants, Plants For All Seasons, are individual varieties which provide color and interest for at least two seasons of the year and not just a fleeting flush of flowers followed by months of dull foliage. I feature over five hundred of them in my latest book, Powerhouse Plants, and every month in Gardeners' World, Britain’s top-selling garden magazine (and also available in the US) I focus on one very special Plant For All Seasons, highlighting three features which bring color to the garden at different times of the year. This month, in the magazine, I feature Hypericum 'Albury Purple'. And every month here on my Transatlantic Gardener blog I bring you details of another, this month it’s Clethra alnifolia ‘Ruby Spice’ (click to enlarge), winner of the Royal Horticultural Society’s Award of Garden Merit. ‘Ruby Spice’ has two special features – three, if you count the fragrance. At about this time of year, the upright spikes of flowers are opening at the shoot tips and in the leaf joints of the upper foliage. Set against deep green foliage and deep rose in colour, they don’t fade as the flowers of older pink varieties do and they also feature a heavy sweet fragrance. Then, in the fall, after the flowers have gone, the foliage turns bright buttery yellow to create an entirely different feature. ‘Ruby Spice’ is a very manageable plant, reaching just 6ft/1.8m, perhaps a little more, and forms an attractive bush without any pruning. 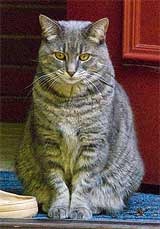 It does, however, need an acid soil although it seems happy in full sun (as long as the soil is not dry) or in light or partial shade. Hardy to USDA zone 4 and RHS zone H5, it can even be grown in a large container of ericaceous (lime-free) potting soil. This is my fourth monthly piece about Powerhouse Plants, Plants For All Seasons which don’t flare and fade with two weeks of flowers and fifty weeks of boring leaves. Last month I featured Rosa rugosa, and before that Kolkwitzia amabilis Dreamcatcher (‘Maradco’), Actaea rubra and Paeonia ‘Sarah Bernhardt’. So when you look at a plant in flower at the nursery or in a catalog, always ask: What else does it do? Please take a look at Plants For All Seasons in Gardeners' World magazine each month. And check back here for monthly posts about other Powerhouse Plants – the Plants For All Seasons. 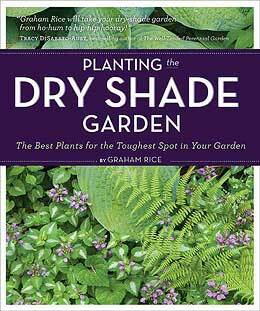 Or you can find out more about the book at the Powerhouse Plants webpage. Subscribe to Gardeners' World magazine In North America,Gardeners' World magazine is also available in Barnes & Noble and other good bookstores. Powerhouse Plants, Plants For All Seasons, are individual varieties which provide color and interest for at least two seasons of the year and not just a fleeting flush of flowers. I feature over five hundred of them in my latest book, Powerhouse Plants, and every month in Gardener’s World, Britain’s top-selling garden magazine (and also available in the US, from Barnes & Noble stores for example) I focus on one very special Plant For All Seasons, highlighting three features which bring color to the garden at different times of the year. This month, in the magazine, I feature Hydrangea aspera subsp. sargentiana. And every month here on my Transatlantic Gardener blog I bring you details of another. Last month it was a recently introduced shrub, Kolkwitzia amabilis Dreamcatcher (‘Maradco’). This month it’s the old favorite Rosa rugosa. One of the toughest shrubs you’ll come across, Rosa rugosa (above, click to enlarge) features a long season of large single flowers overlapping in season with large, long-lasting red hips. The deeply veined foliage is attractive too, most forms have a lovely fragrance, and they rarely grow taller than 8ft/2.4m, usually less. And yes, this is a tough plant. It grows naturally in areas of China and Siberia where the sea freezes over so it takes ferocious winters as well as salt spray. It flowers well in a wide variety of soils, including almost pure sea sand, and needs little pruning except perhaps to shorten an occasional long shoot. And that’s just as well because the stems are exceptionally thorny – so it’s ideal as an informal hedge to keep out the neighbor’s dog. But avoid ‘Roserie de l’Hay’ which rarely produces any hips at all. Please take a look at Plants For All Seasons in Gardeners World magazine each month. And check back here for monthly posts about other Powerhouse Plants – the Plants For All Seasons. This is my third monthly piece about Powerhouse Plants, Plants For All Seasons which don’t flare and fade with two weeks of flowers and fifty weeks of boring leaves. These are plants which provide color and interest for at least two seasons of the year and not just a quick flush of flowers. So when you look at a plant in flower at the nursery or in a catalog, always ask: What else does it do? 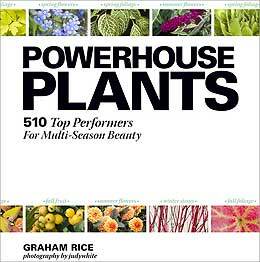 My new book, Powerhouse Plants, includes details of over five hundred plants that do something else at another season. And every month in Gardener’s World, Britain’s top-selling garden magazine (and also available in the US) I focus on one very special Plant For All Seasons, highlighting three features which bring color to the garden at different times of the year. And every month here on my Transatlantic Gardener blog I bring you details of yet another – this time, Kolkwitzia amabilis Dreamcatcher (‘Maradco’). Basically, this is a much improved version of a familiar beauty bush, Kolkwitzia amabilis, which flowers for just a few short weeks in late spring and early summer. Dreamcatcher adds months of fascinating changing foliage color. In spring, the new shoots are coppery red, then the foliage turns yellow as it matures. Later, it becomes chartreuse with gold hints through summer and in the autumn, and it changes again becoming orange and gold in a final fall flourish. In my experience Dreamcatcher also makes a lower, more spreading plant than ‘Pink Cloud’, the usual form seen, and the larger of our two seven year old specimens is about 3ft/90cm high and noticeably wider. More widely grown in North America than in Britain, British gardeners should hunt it out. You can read more about Kolkwitzia amabilis Dreamcatcher (‘Maradco’) in a blog post here back in 2010. Please take a look at Plants For All Seasons in Gardeners World magazine each month. And check back here for occasional posts about other Powerhouse Plants – the Plants For All Seasons. Powerhouse Plants are Plants For All Seasons, plants which don’t simply do their one thing and then sit there looking dull for the rest of the year. These are plants with impact at two, three or perhaps four different seasons. They provide so much more than just a few short weeks of flowers. So when you look at a plant in flower at the nursery or in a catalog, always ask: What else does it do? You can find details of over five hundred plants that do something else at another season in my new book Powerhouse Plants. And every month in Gardener’s World, Britain’s top-selling garden magazine (and also available in the US) I focus on one very special Plant For All Seasons, highlighting three features which bring color to the garden at different times of the year. This month, it’s Viburnum plicatum subsp tomentosum 'Mariesii'. But here I thought I’d show you another, a perennial: Actaea rubra, the red baneberry. First, the bright juicy spring shoots emerge and then around this time of year, depending on the season, and this season is a late one, the leaves have expanded and make a fine fresh green background to the fluffy heads of white flowers opening from creamy buds. Then it’s not long before the rather dramatic change takes place; the flower heads stretch and the berries form, in bright and shining and scarlet red. Quite a different look, two quite different appeals from the same plant. You might also like to take a look at Actaea pachypoda ‘Misty Blue’ (‘Pewter and Pearls’ is similar): the same white spring flowers; then white berries held on red stems – but with the bonus of blue-tinted foliage. Today I start a new series in Britain’s best selling gardening magazine, Gardener’s World. Starting in the May issue, on sale in Britain today (and also in the US soon), Plant For All Seasons takes up the theme of my new book, Powerhouse Plants, and each month reveals the many facets of a plant that looks good at two, three or perhaps even four seasons of the year. Choosing plants with multi-season beauty is the way to create the maximum impact from every inch of your garden. So in Gardeners World magazine this month, I show the many seasonal appeals of Fothergilla ‘Mount Airy. And here I’m offering you another plant to consider, this time a hardy perennial peony which looks good both in spring and in summer. The rich red shoots of ‘Sarah Bernhardt’ are colorful and bright from the moment they peep through the soil in spring. As they expand, their impact increases and as the flower buds form they still look bright and fresh. Plant blue flowered Anemone blanda around it for a sparkling spring picture. Then in June the big and blowsy, super scented, dark centered, rose pink flowers open, sometimes with a few dark flecks, and give us the sumptuous treat for which peonies are so much loved. OK, it’s true, it’s not perfect: the flowers are often too big and heavy for the stems, so discreet support is advisable. And they don't last for ever - that's why an extra, earlier foliage display is so valuable. But this is nevertheless a sumptuous flower, introduced by Victor Lemoine in France back in 1906. It must be good to still be so popular after so long. I'm back after a turn-of the-year hiatus* – with news of my new book. 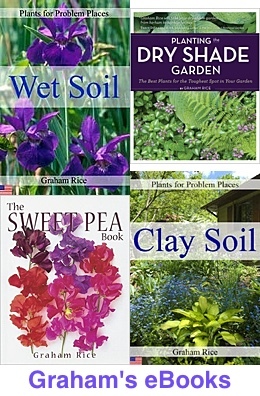 Powerhouse Plants, available in the US and also available in the UK, is a book of over five hundred different multi-season plants. That is, plants which give more than one season of interest in the garden. So - you buy one plant, and it does two different things at two different times of the year! Don’t you just love a bargain? It’s like having two different plants in the same place for just one price. And some plants have three, or perhaps even four, seasons of interest. So when you look at a plant in flower, or with colorful foliage, at the garden center or in the nursery, ask yourself a question: What else does it do? 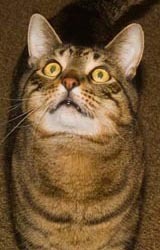 If what you see is all it does, perhaps you need to chose a different variety. The witch hazels with fragrant winter flowers followed later by fiery fall color. The list of these multi-season performers goes on, in fact the list goes on to number an amazing five hundred and ten plants! And I discuss them all in my new book, Powerhouse Plants, with gorgeous photography mainly by my wife judywhite. So my new book, Powerhouse Plants, reveals over five hundred plants with more than just one season of interest. Bargain planting at its best. So when you’re shopping for plants and are tempted by what you see, ask yourself the question: What else does it do?